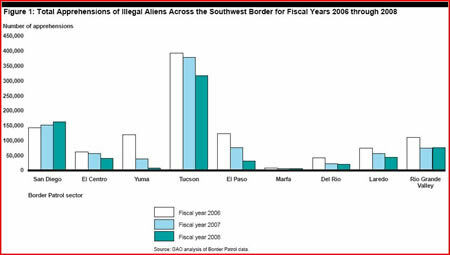 As previously reported here, on September 2, 2009 Congresswoman Giffords organized a community meeting in Green Valley, Arizona to discuss the recent findings of a GAO study regarding interior Border Patrol checkpoints. After reviewing the 147 page report for myself and comparing it to Mr. Stana’s presentation, several discrepancies immediately popped out at me. 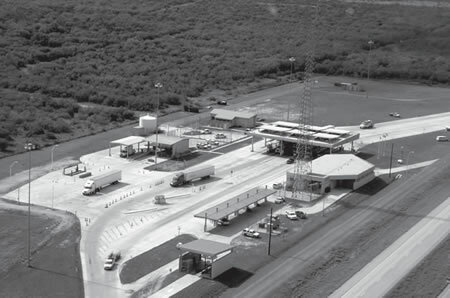 First, Mr. Stana made it clear that one of the primary reasons why interior Border Patrol checkpoints are necessary is because agents at ports of entry only attempt to interdict 30% of illegal activity crossing through them. This 30% interdiction rate is by design. Otherwise Stana claims, commerce, trade and vehicle traffic would be adversely affected at the border. 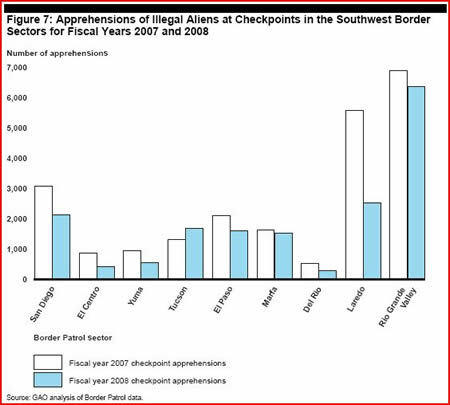 What this means is that the raw numbers show actual border operations and roving patrols are far more effective at interdicting illegal border traffic than internal checkpoints and by diverting agents away from the border, more illegal border crossers are successfully making it into the country than would otherwise. Additionally, Mr. Stana misspoke regarding Border Patrol authority. He claimed the Border Patrol has more authority to interrogate, search and seize at interior checkpoints than the agency has at the actual border or its functional equivalent. This is false as various Supreme Court rulings have made amply clear. In summary, the GAO presentation was misleading from the beginning. It ignored fundamental facts regarding alien interdiction rates inside the country vs the actual border. It misrepresented Border Patrol legal authority at interior checkpoints in comparison to the actual border. And it brazenly claimed interior checkpoints are needed because ports of entry are designed to be purposefully ineffective so as to not overly burden border traffic and commerce. No where in the presentation was any reference made to individual rights, border corruption, violations of our right to travel, violations of our right to be free from unreasonable search and seizure and violation of our right to not be a witness against ourselves. I am appreciative of Mr. Stana’s honesty regarding ports of entry however. No longer can the Border Patrol claim interior checkpoints are necessary to protect us against illegal aliens, drug trafficking and terrorists when ports of entry are purposefully limited in their effectiveness to 30% for the convenience of the government.